In his speech at Jackson Hole, Wyoming, on August 26, 2011, the Fed chairman disappointed most pundits. He did not promise another massive infusion of fake money, i.e., QE3. I suspect that a strengthening in bank lending is an important factor behind the Fed's decision to postpone the pushing of more money into the economy. The yearly rate of growth of our measure for banks' inflationary credit jumped to 8.2 percent so far in August from 4.3 percent in July. 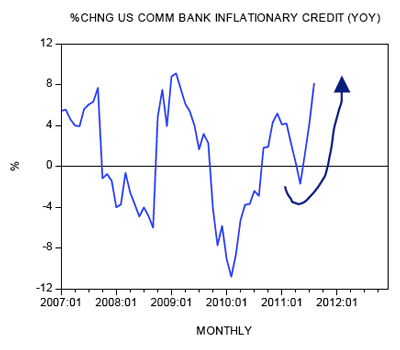 A visible strengthening in commercial bank inflationary credit, i.e., credit "out of thin air," will provide the "necessary" monetary stimulus. This means that the massive amount of money pumped by the Fed since 2008 (over $2 trillion) is starting to be funneled into to the economy by the banks. For the time being, the pace of pumping by the Fed remains buoyant. The yearly rate of growth of the central bank's balance sheet stood at 23.6 percent so far in August against 23.1 percent in July. The growth momentum of our monetary measure for the United States (AMS) jumped to 13.1 percent this month from 11.8 percent in July. Now, according to most experts, massive monetary pumping is going to ignite inflationary expectations, which in turn will give the necessary push to consumer outlays. Once consumers start spending more, via the famous Keynesian multiplier, this will reinvigorate general economic activity and will put the economy onto a path of self-sustaining economic growth. The key in this way of thinking is that currently there is a problem with consumer outlays that, for various reasons, are not strong enough to revive the economy. For instance, rising unemployment causes people to be cautious in their spending, which, according to popular thinking, is bad news. Hence policies aimed at lifting employment must be introduced in order to get the economy going. Digging ditches or introducing various public projects, such as building roads, is strongly recommended. According to this way of thinking, if the private sector is reluctant to boost spending then it is the duty of the government and the central bank to do so in order to bring the economy onto a self-sustaining economic-growth path. This means that government and central-bank policies must err on the loose side, implying that the Fed should aggressively push money, which together with very low interest rates and loose fiscal policies, is expected to revive consumer confidence and push economic activity forward. This is a good summary of the views of Bernanke, who believes that the key cause behind the Great Depression of the 1930s was inadequate pumping by the then-Fed. This time around Bernanke is determined not to repeat the same error. Note again that, according to popular thinking, boosting the overall demand for goods and services is the key for the strengthening of US economic growth. It's true that a strengthening in the demand for goods and services is required for an economic revival. However, any increase in demand must be fully backed up by an increase in the prior production of final goods and services. This increase in demand must be supported by the prior increase in saving and not by loose fiscal and monetary policies. Contrary to most experts — including Bernanke — the more aggressive the Fed's policies are, the worse the economy is going to be. If all that is required to revive the economy is pushing more money, then all third-world economies would be very wealthy by now. The latest trends in banking foretell the possibility of very dangerous times ahead where developed economies go the way of such undeveloped economies and destroy wealth through inflation in the name of stimulating production. As we may soon discover yet again, printing money is no substitute for real wealth creation.